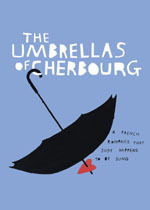 The Umbrellas of Cherbourg opened on 5th March and is booking until 1 October 2011. Directed by Emma Rice, with lyrics translated by Sheldon Harnick, designs by Lez Brotherston, lighting by Malcolm Rippeth, sound by Simon Baker and musical supervision by Nigel Lilley, The Umbrellas of Cherbourg will be produced in the West End by Daniel Sparrow and Mike Walsh Productions, Curve Leicester and City Lights International in association with BE MY Productions. The cast for Leicester and the West End comprises Joanna Riding (Madame Emery), Meow Meow (Maitresse), Carly Bawden (Genevieve), Gareth Charlton (Sailor), Andrew Durand (Guy), Cynthia Erivo (Madelaine), Dominic Marsh (Cassard), Aki Omoshaybi (Sailor) and ensemble members Laura Brydon and Matt Wilman. VIP guests who attended the press night included: Liza Minnelli, Jonathan Ross, Emily Atack, Hayley Atwell, Julian Glover and Isla Blair, Imogen Poots, Laura Whitmore, Little Boots and Rolf Harris.